Ukrainian presidential candidate, parliament deputy Petro Poroshenko believes that Ukraine should hold a dialogue with Russia and seek compromise on every issue but Crimea and integration with the European Union. "The country cannot feel secure until it has a transparent dialogue with the Russian Federation," Poroshenko said in a program aired by Channel 1+1 on Sunday night. In his words, Ukraine must convey to Russia that it will never recognize the "annexation" of Crimea. "We will resort to international solidarity, the judicial mechanism of the International Court of Justice, the mechanisms of the European Court of Human Rights and the mechanisms of sanctions," Poroshenko said. Ukraine has to convince Russia that it will not deviate from the path of European integration, he said. "Ukraine has chosen Europe. Ukraine is determined not only to implement the Association Agreement but also to become a full-fledged member of the European Union," Poroshenko stated. On all the other issues Ukraine is ready to seek compromise with Russia, the presidential candidate added. 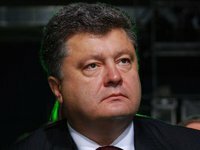 Poroshenko specified his idea of Ukraine's future membership in the European Union in an interview with Channel 5 on Sunday night. "I have no doubt that Ukraine can become a member of the European Union in ten or eleven years, say, in 2025," he said. In the opinion of Poroshenko, Europe has an impression that it owes something to Ukraine. "This opportunity must be used. The window of opportunity will not stay open for long. We need to demonstrate our determination to carry out the reforms within this short period… in order to achieve the prospect of [EU] membership," the presidential candidate noted. As to whether Ukraine might become a federative state, Poroshenko said, "Ukraine was, is and will be a unitary state."